Braces that use wires and brackets are no longer the only option if you want to improve your smile. 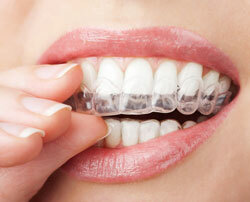 The Invisalign system relies on clear, removable aligner trays that place constant, gentle pressure on teeth. Before your treatment begins at Beautiful Smiles Dentistry, your Roseville, CA dentist will take digital impressions, X-rays and photographs of your smile. The digital information will be combined to create a three-dimensional image of your mouth that can be manipulated to create a virtual representation of your orthodontic treatment.